You will make a very good judge Katie! That cat chaser one is very funny!! Judge Judy should be worried! 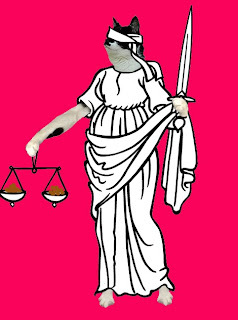 You make a pawsome Judge. Hey, you could use that sword to score some non-diet food!! oh my! GG should really learn her lesson and not leave you alone for so long eh?! oh my dear... let me help you OFF with your robe.... yah babe! Yes, we see a TV show in your future, Judge Katie! Oooh. As a judge you get a cool hammer to whap with. wow Katie, you are a fabulous judge, wonderful work! I know you could be totally fair and unbias Katie! 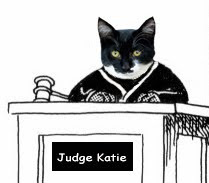 Thanks for watching out for us cats...Judge Katie! Katie, if we ever need to be in court, we want you to be our judge! Katie: I think Judge Judy and Judge Mathias oughta be worried if YOU'RE on the case! Good job!! You make a great judge--we may need your help convicting mama of her heinous crimes against us! You seem like you would be a tough judge... dawgs better watch it. 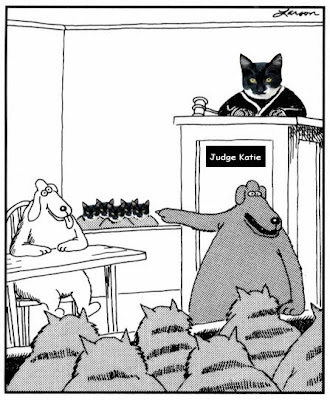 Woofies better watch out when us kitties are the judges and jury!! Woo hoo! Your Honor, we think you make an excellent judge. Is it true that dog-lawyers work pro-bone-o? Katie, I would trust you to make sure justice is done in every case! We think you would make a very good judge Katie. Oh your Honor...Judge Judy doesn't have a chance! Hey, we just noticed you love t/d, too! We ask for it every morning (noon and night too...heck it never hurts to ask) and it is helping our toofers a lot!